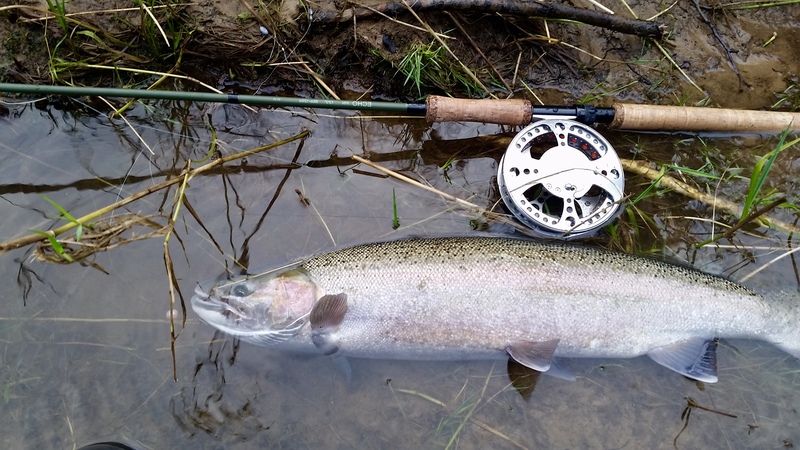 Winter is here, and there are steelhead in the rivers. Right now we are playing the water level game, and it looks like we may have more ups than downs until the end of the month. Weather has been crazy, with snow up north, ice in Eugene, and it looks like we are getting plenty of snow pack in the Cascades. One of the things that makes the early season so fun is the game. I get excited when I see that first big winter swell in late November, thinking of the first winter steelhead riding up stream on the high water. Then the anticipation, watching the river levels drop into shape, and getting to see the waters again. I like where fish live, as much as I like to catch them I like to spend time in the places we fish. I like the smell, the sound, and the color. I like the weather, even though it’s not always the most comfortable, it sure beats being inside when the days are so short. Although the propane heater, and hot coffee sure make it a lot more comfortable. As much as I like this season, it’s like seeing an old friend. It feels good to see the Siuslaw, and Alsea again, but January and February are coming, and that’s more like getting down to business. More breaks in the weather, and more options of places to fish, I’m ready. I hope you are too.